The Rebel Sweetheart. : Spotlight | Human Heart Nature Jiggly Bath Jelly. Spotlight | Human Heart Nature Jiggly Bath Jelly. It was in Myeongdong a few years back when I first came across this thing called 'shower jelly'. I was on my way to the main shopping street when I passed by the LUSH store near Myeongdong Station and saw one of their staff doing some sort of product demo with what appears to be a big blob of gelatin. The curious cat in me just had to stop by and see what the crowd was gawking at, (also because the scent of whatever thing that the LUSH guy was holding was very inviting) and turns out, it was indeed a big blob of gelatin that works as a cleansing body wash. LUSH calls them Shower Jellies, and these soft, jiggly soaps give a whole new meaning to the 'bath time is fun time' concept. Fast forward to two weeks ago, one of my favorite local beauty brands launched their own version of this fun bath time treat. 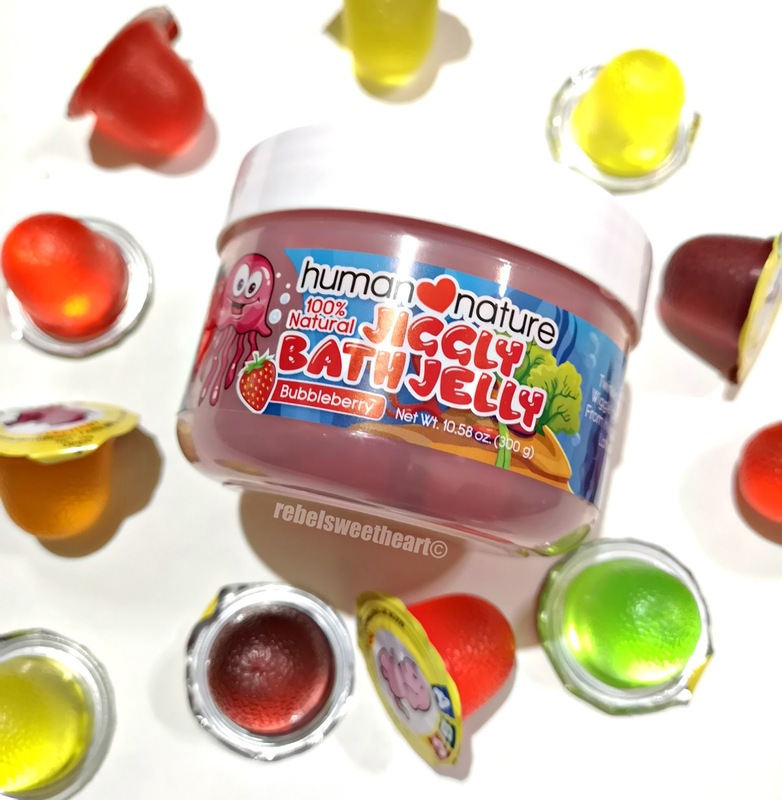 Say hello to the Jiggly Bath Jelly from Human Heart Nature! 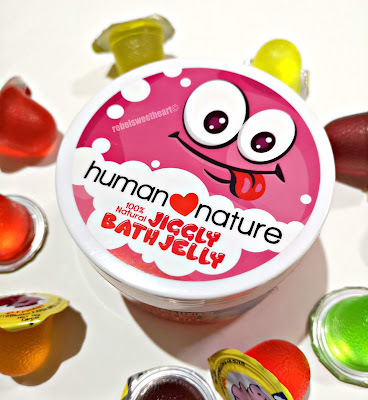 Human Heart Nature Jiggly Bath Jelly. Made with coco-derived cleansers to flush away dirt and grime and vegetable-derived glucose and glycerin to moisturize the skin, the Jiggly Bath Jelly is dubbed as 'the fun way to sneaky clean.' The product is contained in a 300-gram plastic tub and is available in just one variant - Bubbleberry. Jiggly Bath Jelly in Bubbleberry. It looks and jiggles like a jelly, and has a sweet yet subtle strawberry scent. Looks and smells good enough to eat, haha! 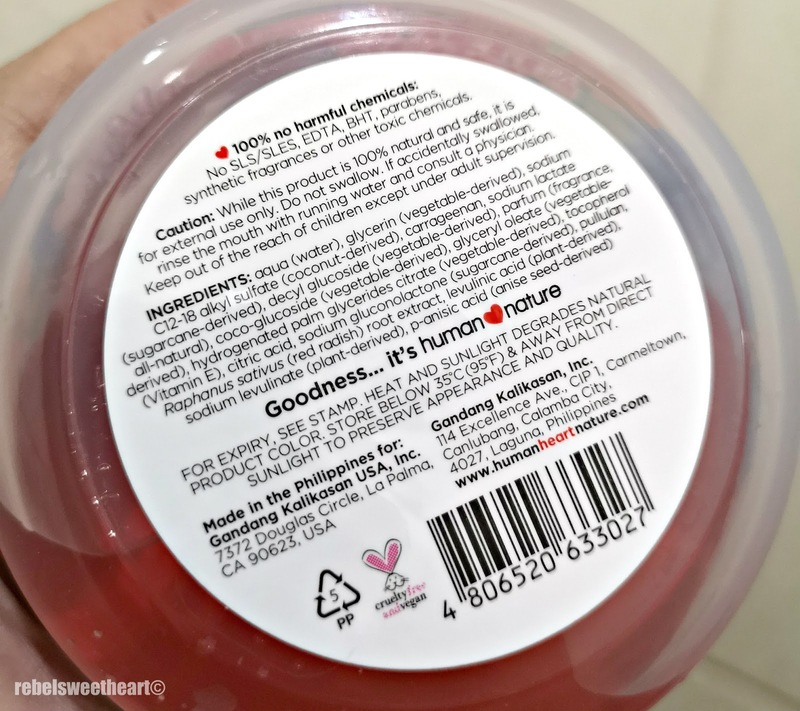 According to instructions, you can use this product as a hand wash or a body wash by either tapping the whole jelly out onto your palm or just scooping out a small amount. We prefer doing the latter as the consistency of this Jiggly Bath Jelly isn't as springy or as resilient as the ones from Lush. 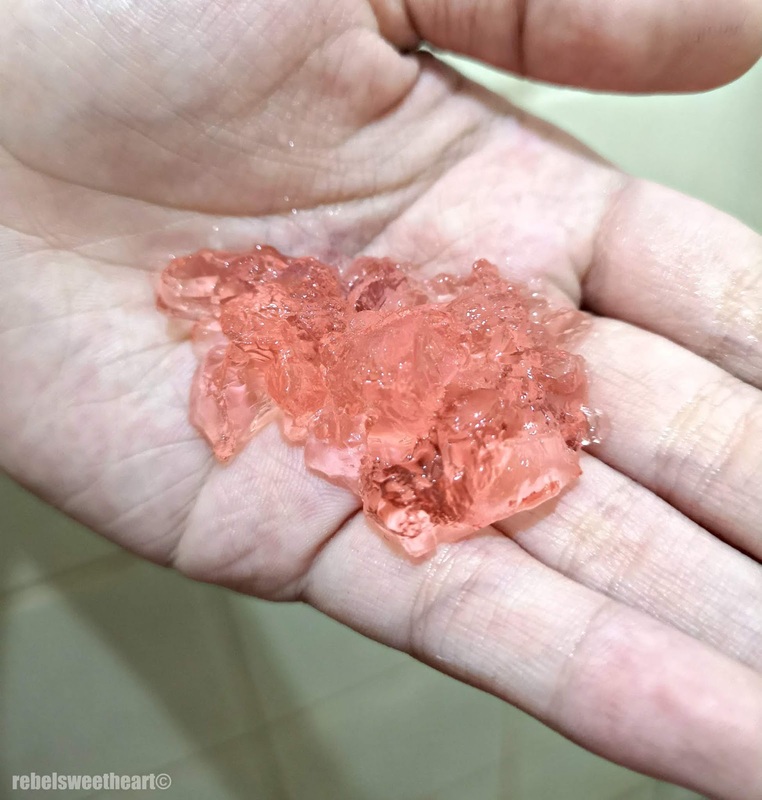 This bath jelly is crumbly and tends to fall apart when you scoop it out, unlike the Lush jellies that you can actually rub on the skin like soap. Crumbled jelly on the palm of Yue's hand. On the bright side, at least it's effortless to crush the jelly into a loofah and build a smooth and soapy lather. Also, you only need a small amount to clean the entire body so I reckon this tub of bath jelly will last us longer than a regular bar of soap or a bottle of body wash. List of ingredients and other pertinent information. Although this product is marketed to kids, that doesn't mean adults can't use it. I've bathed with this product several times already (sssh, don't tell my son I'm using his bath jelly, lol) and I love how it cleanses without drying the skin. The scent is lovely too, and it lingers even if you've patted your skin dry. 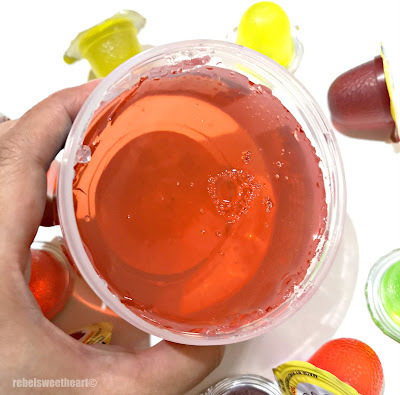 If you want that refreshing, cooling effect on the skin, you can store the Jiggly Bath Jelly inside the fridge and take them out before you hit the shower. Very relaxing, especially after a long and stressful day at work (or school, as far as my son is concerned). 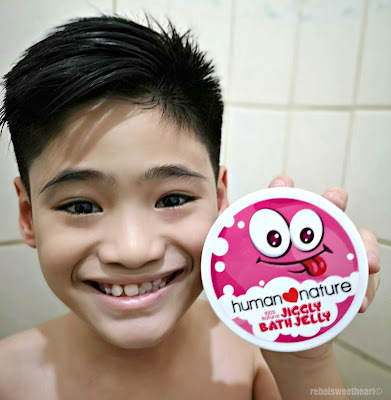 The Jiggly Bath Jelly retails for Php 299.75, and is available at the Human Heart Nature online store, at Human Heart Nature Laguna, and other Human Heart Nature branches nationwide. I love these kids of products, and my niece and nephew would love them. they are going through a phase of slim loving, so this may be perfect for them! This look like a fun product! I would like to buy this. Looks like the perfect thing I need to make my baths fun, who said adults canyc have their own bath jelly lol. This looks like so much fun! I will have to check it out for the kids! I have never heard of this product before but it looks a nice product to try and I am sure my daughter will love this. 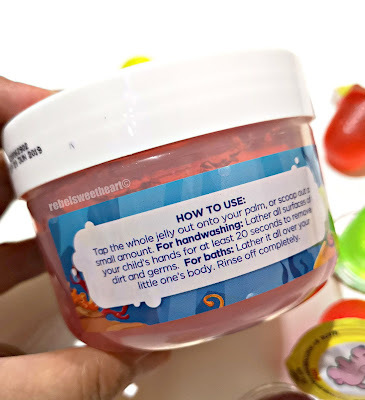 I hadn't heard of jelly soaps before, but it seems to be a nice idea...especially for kids, would make bath time more fun. I will check Jiggly Bath Jelly. Looks like fun to have on bath time. And the coco ingredient sounds light for skin. This looks like such an awesome bath time addition. My kids would love this. This my first time hearing this Human Heart Nature Jiggly Bath Jelly and it is something that my daughter would really love. These look like the perfect product for little ones to enjoy. Making bath time super fun is a great idea. My First 'Official' Althea Haul! 10 Easy Ways To Make Your House Look Expensive. Miniso Opens in SM San Pablo! Interventions and How To Plan Them.